When an album plops into the Blabber office with a press release noting it was recorded in rural America by a husband and wife team we generally fire up the search engine and head to backwoods Appalachia for reference points. 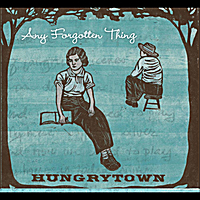 Hungrytown however forsake old time country and down-home hoots. The reference points here are the folk duos who populated the sixties from Simon and Garfunkel (OK, two guys but you get the drift) to Richard and Mimi Farina and all points between. Back then a whiff of old time Americana music might occasionally peek through but the primary influences were English (or Scots or Irish) folk song delivered in a bright collegiate style, precious, unsullied. Hungrytown, Rebecca Hall and Ken Anderson, capture that innocent era perfectly on this, their second album. Hall has a crystal clear voice while Anderson provides accompaniment and harmonies that have a naïve, innocent vibe especially when he adds glockenspiel to his guitar, mandolin, banjo and assorted other instruments. At times there is just too much sweetness and light and although they never descend into Puff the Magic Dragon land a song like Rolling Train with it’s opening lines “You’ll never stop the wind, never stop the rain/By standing in the path of a hurricane” is just a little bit too twee. Although they teeter on this edge on a few other songs happily the majority are rescued by some excellent harmonies and on the opening song “Year Without Summer” they turn in a real showstopper. A historical tale based on the long winter that followed the eruption of a volcano in 1815, Hall sings like Judy Henske on a song that could have been delivered on her Farewell Aldebaran album. The measured delivery even has some touches of early Pentangle about it and the addition of harmony vocals from Laura Molinelli adds a fine icy grandeur. The dreamlike Calliope with its circus waltz tune and Sally Lazy, a distant cousin to Sally Go Round The Roses could sit easily on a Hollywood psychedelic soundtrack featuring the likes of Tuesday Weld running through a meadow in slow motion. Branden Barnett is the singer, guitarist and main writer in Ghostshirt, a Columbus, Ohio band who last year embarked on a project to record a song a week and offering them for free download. Some of the results can still be bought here. This project and the band were heartily supported by Post Card From Hell, an online community originally dedicated to the music of Uncle Tupelo, now an energetic group of folk, mostly American, who discuss music, food, beer (and music) and, importantly, support their favourite bands with an intensity that is sometimes frightening, they’ve even pitched in to help with the costs of repairing broken tour vans. Their relationship with Ghostshirt is such that the band played at a mini festival held at the home of one of the members of the Postcard group. He was immediately inundated with suggestions and within a matter of days the first three songs have been recorded (he plays all the instruments) and posted for download. Blabber’n’Smoke thought that this is a great example of musicians and fans interacting using the Internet and modern technology, demolishing some of the traditional barriers. With projects like Kickstarter fans have an opportunity to support musicians’ projects that goes beyond buying albums and attending gigs and this type of project can only help the artist gain more listeners and hopefully a bigger audience. So kudos to Branden for his generosity in sharing some music. He’s OK with it being shared outwith Postcard. So have a listen and if you like it head to the Ghostshirt site and investigate them, a good band indeed. Available here, the link only lasts 6 days so grab it while you can. I’ll post the next links as they come up. Seems that talented female singer/songwriters keep tumbling from the Americana womb. Every month several albums find their way to Blabber’n’Smoke with smoky voiced sirens, back porch country girls and rootin’ tootin’ honky tonkers all well represented. Separating the wheat from the chaff might be a thankless task but in all honesty there’s been precious little chaff of late. The latest to tickle our fancy is this grower of an album from Amy Lashley who grew up in a small (population 376) community in Indiana and who now resides quietly in Nashville with her partner Otis Gibbs, himself a seasoned performer of powerful and at times politically charged songs. While Gibbs travels the world Lashley apparently avoids live performance but together they’ve delivered this fine collection of observations and tales that resonate with a sense of being out of step with life in general. Describing herself as an “emotional misfit,” uncomfortable in social situations there is no lack of confidence in the delivery of these songs. Lashley sings well with no obvious discomfort and the style swings from country blues (Lil’ Red Girl), old time swing (Livin’ On Beans and Cornbread) to attractive country pop (Night With No Moon). Her lyrics however point to an uncomfortable life that only now has found a sense of comfort. Having said that this is by no means a confessional type album with only the last song Older Brother appearing to be autobiographical. It’s a testament to Lashley’s skills that one is unsure if this is a celebration of or a put down of her brother. All in all it’s an album that repays repeated listening. For every Steve Earle or John Prine there are a dozen of other singer songwriters who don’t shift as many units or garner as much press acclaim. You could call them second division but essentially that’s unfair. Time after time I’ve been pleasantly surprised and on occasion gobsmacked by an album that is simply terrific but which struggles to get out of the starting gate. There’s a vast hinterland out there, jobbing musicians, troupers indeed who might not have the killer touch or the luck to be plucked out and cast into the spotlight. Instead they carry on, delivering quality songs to a small but discerning audience who benefit from a unique relationship with the artist, mingling after a gig, communicating via the big old interweb and most recently helping to finance the recording and delivery of an artist’s album. If a police artist was asked to produce a photofit of someone fitting the above description then it could very well look like Greg Trooper. With several albums under his belt since the mid eighties he’s had his songs recorded by Steve Earle and Vince Gill and been produced by Buddy Miller and Dan Penn. Setting up his own label, 52 Shakes, he’s used kickstarter to finance this album with donations from his fanbase. Well, his fanbase kicked in and here’s the result, released in time to prime UK fans for a tour in April and May. While the album doesn’t blaze any trails Trooper is a confident and assured writer and he’s gathered a band that deliver a sweet, slightly southern soaked slice of Americana with a Muscle Shoals organ and guitar sound on many of the songs. This results in the driving Time For Love and the J.J. Cale groove of Nobody In The whole Wide World, both guaranteed to have the hips swinging. Elsewhere Trooper’s singer/songwriting roots are well displayed on a brace of songs that deliver the goods in the tradition of Guy Clark and Butch Hancock. First True Love is a delicate love song while Everything Will Be Just Fine could be used as a template for a perfect Americana troubadour song. The good news is that Trooper is touring the UK from late April with some Scottish dates including Laurie’s in Glasgow on 30th April. Check the others on his website. The Foghorn Trio. Sud de la Louisiane. Been a while since we’ve had any old time string band music to mention so here’s one that’s coming out in May and is an absolute delight from start to finish. The Foghorn Trio comprise of two members of the Foghorn Stringband, an outfit from Portland, Oregon, Caleb Klauder (fiddle, mandolin and guitar) and Stephen Lind (fiddle, banjo and guitar) who have teamed up with Quebec born Nadine Landry who plays bass and guitar with all three sharing vocal duties. The title is a bit of a misnomer as there is little in the way of Louisiana here other than the title track, a Cajun song delivered by Landry. That said the album was recorded in Eunice, Louisiana by producer Joel Savoy whose rural studio is featured on the album cover. The meat of the album is in god fearin’ honest homilies delivered in the style of the likes of the Carter Family along with strong instrumentals that feature the band’s dexterity. The majority of the songs are covers and they are astonishingly good at capturing the earnestness, innocence and to be fair the slightly hokum quality that is a quintessential ingredient in the pleasure one gets from listening to pre war country music. Two songs illustrate this perfectly. The Carter Family’s Hello Central is an aching plea to the Almighty from a youngster trying to contact his deceased mother, while Benton Flippen and The Smokey Valley Boys’ Go Home is a tremendous temperance plea. Listening to the versions here one could be forgiven for thinking you had been transported to a black and white world where television had not yet been invented and the sounds you hear guide your moral compass with your primary release being the weekend dance where you can let loose to the joyful fiddle and guitar of A Bottle of Wine and Gingercake. Two originals by Caleb Klauder, the instrumental Puttin’ Up The Wood and Just A Little, a song very much in the tradition fit right in to the overall feel of the album. So pull out your bible, put away that demon drink and thank God you’re alive and able to enjoy such a fine recreation of past, more innocent times served with such virtuosity and love. The Foghorn Trio play some dates in the UK in May. Back in the eighties Glasgow pop had one of its occasional high points with chart attacks from honey voiced crooners and literate jangle rockers. Lurking beneath the surface however was a tribe of rock ‘n’ rollers drinking from the well of primal beat. James King, The Kissing Bandits and The Cuban Heels all danced around this totem but chief of all and the only survivors are The Primevals. The Primevals were cooler, greasier. They were wired to the mainframe, sucking from the teats of The Cramps, The Gun Club, The Saints and Mike Wilhelm’s biker rock with a healthy dose of Captain Beefheart and some free jazz from the likes of Sun Ra and Pharaoh Saunders included. A heady mix indeed and one which offered them the opportunity to release several albums on the famed new Rose records and gain cult status in France, always appreciative of leather clad rock’n’rollers. Recording throughout the eighties they petered out in the next decade but since 2000 have had sporadic reunions and live gigs with a release in 2007, ‘There Is No Other Life…And This Is It” on their own label , Triple Wide. A fabulous compilation of their New Rose recordings entitled ‘On the Red Eye’ came out around 2005 and is well recommended for anyone interested in a Glasgow take on garage rock or indeed anyone with a working nervous system. Now, four years down the line since their last offering The Primevals have a new disc out, Disinhibitor, a title Bobby Gillespie must be kicking himself for missing out on, and a short tour of old French haunts coming up. So, thirty years on can the then young acolytes of rebel rock still cut the mustard. The answer is undoubtedly yes. Never ones to simply barrel down a basic route The Primevals here deliver a huge slab of sound which is rooted in sixties raunch with a punk attitude and a knowing wink to outsider music. Older and wiser perhaps but certainly more grizzled they pack a punch that from the off hits the listener in the gut. Anyone who digs the MC5 will be totally hooked by the two and a half minute maelstrom of Defying Science that opens the album. From here on in it’s a roller coaster of a ride with the band delivering visceral tunes such as American Road Trip and Venus Uncovered, the latter channelling the Cramps’ pile driver rhythm with an almost unhinged edge to it. Guitarist Malcolm McDonald is all over the album with screaming slide and howling feedback, his best moment perhaps on The Shape That Life Bent Me Into which almost out guns The Gun Club. In addition he plays some wild freakout organ on Someone To Love. With a rock solid rhythm section in Paul Bridges and John Honeyman song after song here drills into the listener. Ringmaster and vocalist Michael Rooney towers over the songs, full throated and super cool especially on Superfreak V11, a twisted psychedelic storm of a song. With 18 songs crammed into an hour there is no let up here for the listener, when the band temporarily abandon their blitzkrieg rock ‘n’ roll for a more “mellow” approach they hit you with waves of alto sax from the church of Albert Ayler. Sixties band The Creation described their sound thus “ our music is red with purple flashes.” The Primevals are a modern day version of this but they do it in high definition. Overall a triumph and a must for anyone who equates rock ‘n’ roll with leather trousers and a bad attitude.